It’s true, you know. Sometimes I tend to forget how wonderful my life is, especially in times when I allow frustration or doubts to creep into my mind and fill me up with dissatisfaction. Then I think about at least three good things I have going on in my life at the present moment and I become thankful for my life all over again. 1) My dog Milo who is absolutely the cutest old man with the saddest eyes in the world. This look is not a combo that any dog or human bean can beat. The minute he cuddles up to me on the couch (after trying to bite me no less), my heart just melts. He’a a naturally independent dog, you see. Attention-seeking Milo may be, but he is content to sleep alone without anyone beside him most of the times. So yes, it feels like a bonus when he snuggles with me. 2) My cable TV which has all the channels available along with HD resolution, so I can watch any programme I want at anytime and any day of the week! If only “The Duggers Family” and “Kate + Eight” are still playing on Discovery Home and Living. But hey, having HBO and FX are pretty awesome already. If I ever had to have a TV channel to epitomise me, FX would be the one. It’s smart, witty, funny, quirky cool, stylish and has the best collection of songs. So me. Haha! 3) My literacy, otherwise I wouldn’t be able to appreciate excellent TV shows with topnotch writing such as “Scandal”, “Games of Thrones”, “Mad Men”, “Archer”, “Two Broke Girls”and “Californication”, just to name a few. Without my literacy, I wouldn’t be able to laugh at enjoyable reads such as Mindy Kaling’s “Is everyone hanging out without me?” and Rick Riordan’s “The Heroes of Olympus” and “The Kane Chronicles”. Eh, I said enjoyable, not Pulitzer-winning reading material. Enjoy your week, every birdie! And if you’re so inclined, do share your list of three things you’re thankful for today. The universe will love you for it. 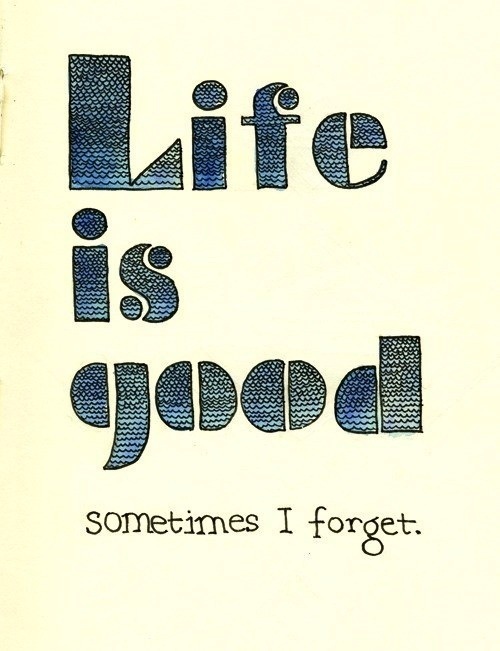 Remember, life is good.